A small Alice Pack makes a good bugout bag. It does not matter whether you are bugging out by car or on foot. You still need to check your bags once in a while. For me spring and fall works. 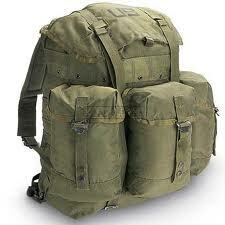 I look at a bugout or a get home bag as something to get me to a safe place in a short period of time. They are different from an INCH bag or I’m never coming home bag. Whether you are bugging out by foot or in a vehicle, you still need to carry similar items. The vehicle just lets you carry more of them. FOOD -Three days’ supply of food minimum, (I carry more) to be determined by size and age of family and personal needs. • Canned food – meats, tuna, sardine, fruits, vegetables chili etc, (I avoid these as to heavy) . One Qt. Military canteen. At least one depending on availability of water. Aquamira Tablets, 4-year shelf life, or a good quality water filter like the one made by Aquamira, Katadyn or First Need. I like the Aquamira’s Frontier Pro which only weights 2 oz and will filter 50 gallons of water. The cost is under $25.00. Bar of soap, small. I use the little ones out of motels. Feminine supplies if needed, they can double as first aid dressings. Personal items, tooth brush etc. Insect repellant, many some insect repellents will double as a fire starter, check yours. 100% wool blanket is the second best choice for warmth. Check the military surplus outlets and thrift stores. A good poncho, not the cheap plastic ones. They can also be used to make a temporary shelter. BlastMatch, Strike Force, Sparkie or varies fire steels are all commercial manufactured fire starters that will work after having been wet. I carry at least one of these in addition to matches. Legal papers, money, insurance policies and other important documents. A good LED flashlight and spare batteries. I carry a Powerfilm USB+AA solar charger and Eneloop batteries. It weighs 6.2 ounces including two batteries. CLOTHING is an item that depends on the area in which you reside, and the time of the year. Be sure and pack warm clothes, if you have to stay outside all night it can get cold even when it seems hot during the day. Keep the weigh as light as possible. The kit should contain a minimum of the following items. If possible, package them in a waterproof container. PERSONAL protection or hunting items of your choice. This is just a suggested list for a bugout or get home bag; yours may vary depending on local conditions or your own level of experience. Try to keep them on the light side, unless you are in good condition and are used to carrying a pack. Remember even if you don’t have everything on this list, anything you can put together is better than nothing. This entry was posted in bugging out, Seventy-two hour kits and tagged bugout, bugout bag, get home bag. Bookmark the permalink.